At Greenway Industries we install various types of driveway surfaces in residential or commercial property. One of the popular asphalt surface alternatives is oil & stone. Oil & Stone surfaces are becoming more and more popular because of the classic New England look that the ¾” native stone at the surface give. Greenway Industries plans to provide more of this classic New England look throughout Greater Danbury. How is An Oil & Stone Surface Prepared? Existing asphalt driveways can be converted to Oil & Stone driveways with a few simple preparatory steps. The existing driveway needs to be thoroughly swept by hand or with a mechanichal sweeper to remove all existing surface debris. Small sections of asphalt will be cut out at sidewalks, steps, garage doors, etc to ensure a smooth transition from new stone to those existing locations. Once the prep is complete, a coating of hot oil will be sprayed evenly onto the surface of the driveway. 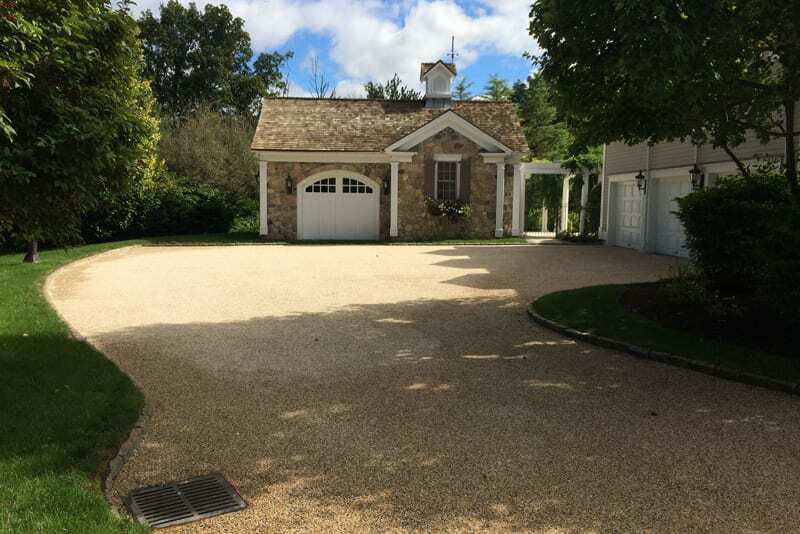 The owners choice of ¾” native stone is then spread over the hot oil at a half inch thickness and raked to an even grade across the driveway. Finally, 3 ton roller is used to compact the stone into the hot oil to lock the stone in place. The same process can be done for newly paved driveways as well. The top layer of stone will be slightly loose with normal wear. It can always be repaired. It doesn’t require resealing like an asphalt driveway does. Snow removal is a little trickier than with an asphalt surface. The plow operator needs to be mindful of riding the plow above the surface so as not to damage the stone. Using a snow blower might work better. Is Oil & Stone Right for Your Driveway? While oil & stone is a distinctive look, it is not recommended in certain situations. For instance, if you have children who want to ride bikes, skateboard, or play basketball, this probably isn’t the appropriate surface. Also, if your driveway has a steep slope to it, there is the chance for erosion of the top layer of stone from rain and snow. If this sounds like your driveway situation you may want to look at the benefits of asphalt. 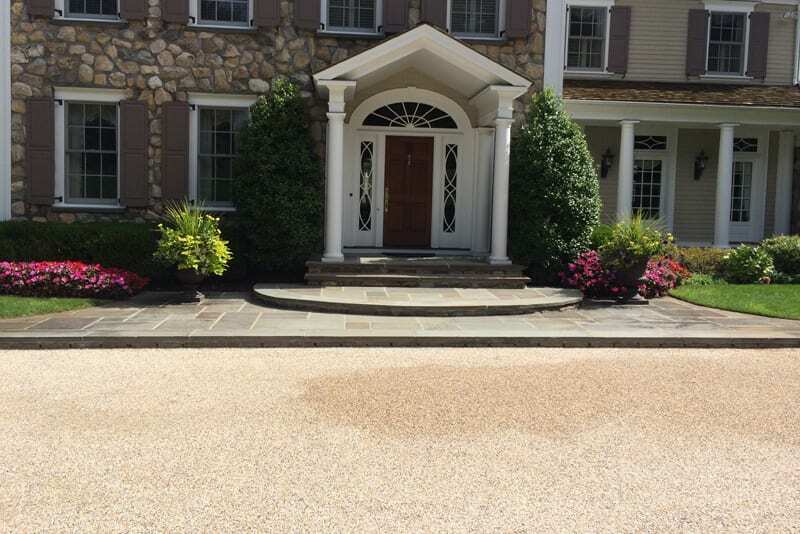 Oil & stone is appropriate for driveways without steep grades and in Danbury areas primarily used for parking. Oil & stone is the perfect surface if you want an elegant, natural, and rural look. Lastly make sure you are looking for the right stuff when selecting your construction company in the Greater Danbury area. Please take a look at our gallery of oil & stone driveway installations for inspiration.